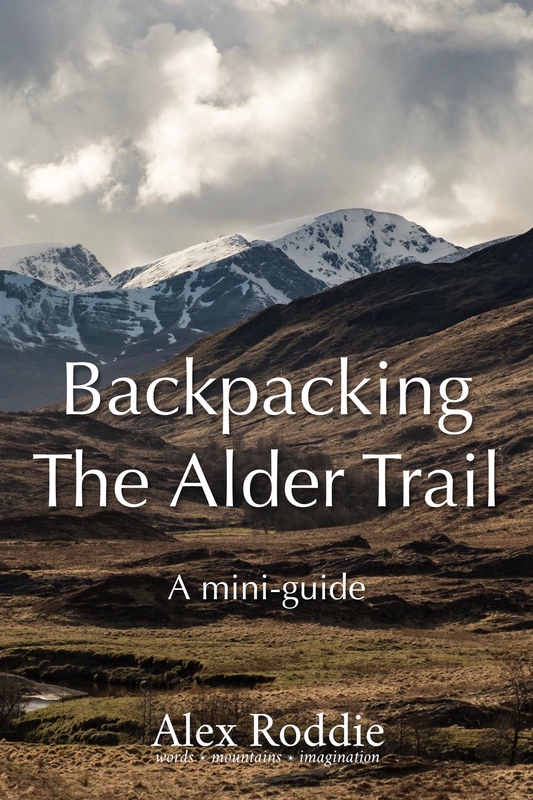 The Alder Trail is a challenging 101-mile backpacking route between Fort William and Aviemore, taking in several Munros and a wide variety of wild country. It was first described in the November 2016 issue of Trail Magazine. Here is a brief guide to enjoying and hiking the Alder Trail. This guide can be enjoyed either right here on the web, or as a discrete e-book. Use the e-book download links above to get a copy for your device. This guide is Reader View friendly on Apple devices. Download your free GPX file for the Alder Trail here. There are limitless opportunities for backpacking routes in the Scottish Highlands, and many of them already have names. The West Highland Way, Cape Wrath Trail, and Skye Trail are well known; others, such as the Affric-Kintail Way or the Sutherland Trail, are less so. More significantly, people have tramped all over the Highlands on foot for generations without labelling their journeys at all. In many ways the Alder Trail is that kind of walk – I’ve just put a label on it. The Alder Trail passes through prime TGO Challenge country, taking advantage of ancient drove roads, mountain passes, and ascents of classic Munros along the way. It has almost certainly been done many times before, if not in the specifics then in the general spirit of the route. When I was approached by Trail Magazine, we refined the concept to come up with a simple proposition: a wilder, more adventurous, more enjoyable alternative to the rather pedestrian East Highland Way. This is not a waymarked trail like the West Highland Way or Pennine Way. It is a significant step up in difficulty from either of those trails, with lengthy pathless sections requiring competent navigation. It reaches elevations well in excess of 3,000 feet at several different points. Experienced stravaigers will find themselves perfectly at home on this route, but I believe it is also a good step up for the less experienced backpacker who has ambitions to take on something like the Cape Wrath Trail. I wouldn’t recommend it for beginners, but it’s a suitable route for the intermediate backpacker. I recommend 7-8 days to complete the Alder Trail. 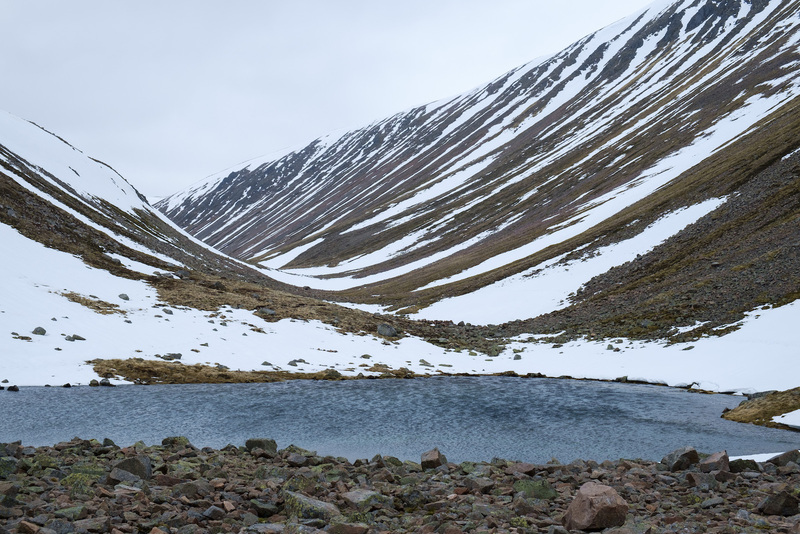 In benign weather, fit hikers may well be able to comfortably do it in 5-6 days, but the sections through the Alder Forest and crossing the Cairngorms should not be underestimated. For much of the year, winter conditions may be present on the higher reaches of the Alder Trail, requiring ice axe, crampons, winter boots, and the ability to use them. I made my journey in May 2016 and was very glad of my winter gear. May is not summer in the Highlands; it’s spring at best, and still winter in the high mountains. As a general rule, there’s a good chance of finding snow on the higher reaches of the Alder Trail from November through to May. For the best chance of avoiding snow altogether, consider September or October; there are fewer midges, and weather is often more settled than during midsummer. In Scotland, walkers are fortunate to enjoy the right to camp in wild country. 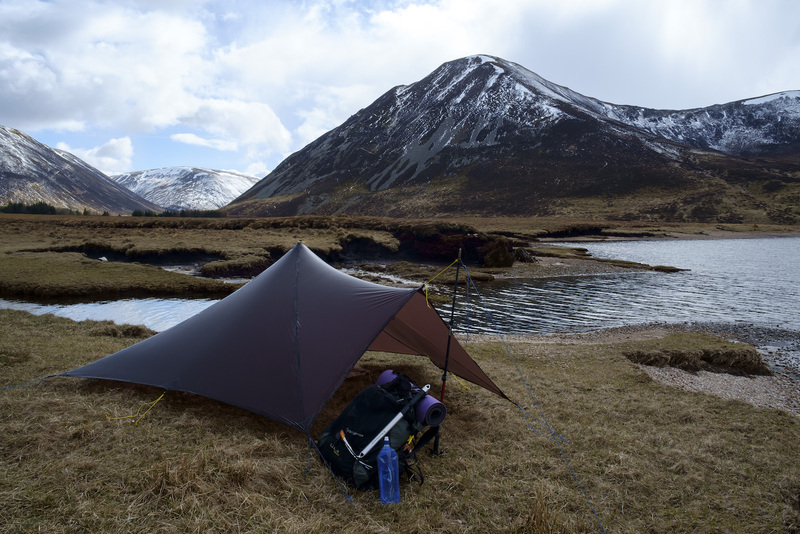 If you’re considering the Alder Trail you should already have experience of wild camping. You must leave no trace; some areas are experiencing real problems due to campers leaving rubbish (or even entire tents) behind, and this will affect all of us in the long run. Respect the natural environment and carry all your rubbish out with you. 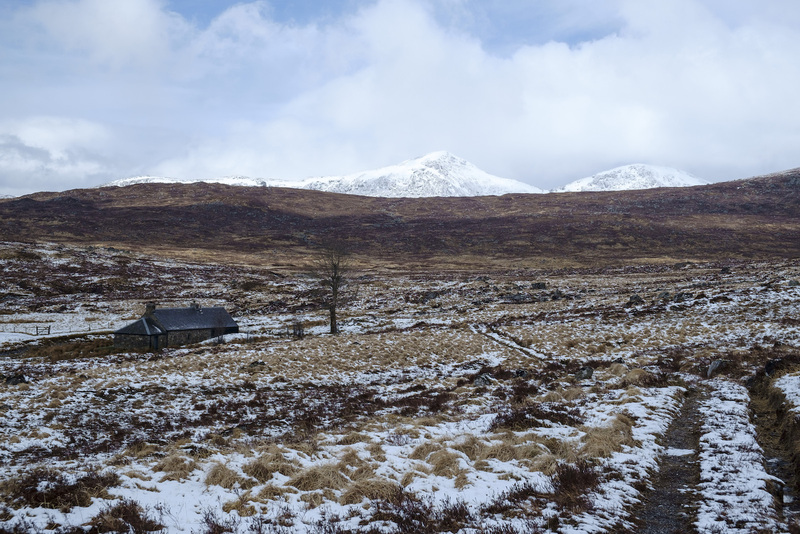 When hiking the Alder Trail you will have the opportunity to stay in several bothies. These are basic, unlocked shelters maintained by the Mountain Bothies Association for the use of all mountain travellers. You’ll have a roof over your head, and there’s generally some kind of sleeping platform, but otherwise facilities vary from bothy to bothy – often a stove and some basic furniture, but a few have luxuries such as a composting toilet or even electricity (both extremely rare!). Bothies are not available for commercial groups. It is recommended that you carry camping equipment on the Alder Trail. 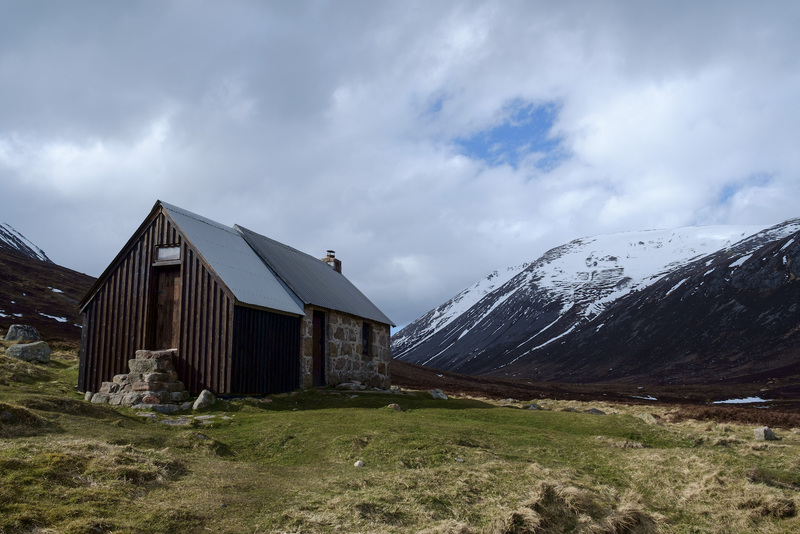 Although the route passes by several excellent bothies, you will find it difficult to get from Dalwhinnie to Glen Feshie without camping – it’s 27.5 miles, more than most people would be willing to walk in a day. 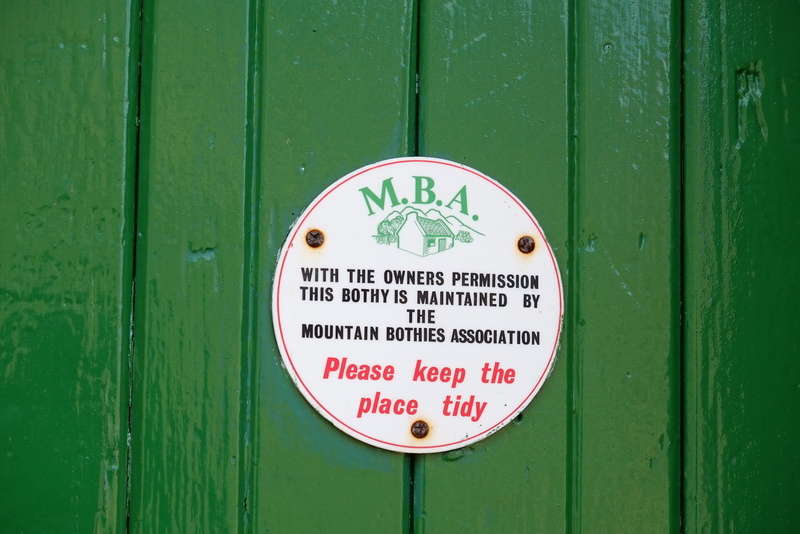 And you may find bothies full, closed, or damaged. Never rely on being able to sleep in a bothy; always have the option of camping if required. It’s worth taking some time to plan logistics before setting out. 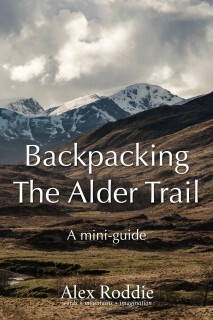 Unlike on the WHW, where you’ll never have to carry more than a couple of days’ food at a time, the Alder Trail is quite remote and there is only one opportunity for resupply. Dalwhinnie is the key to unlocking this trail. It’s at about the halfway point, and has just enough infrastructure to support the thru-hiker. Although you’ll find no shop or supermarket in Dalwhinnie, there is an excellent bunkhouse, adjacent to (and run by the same person as) the local cafe. This is a hiker-friendly establishment. I can’t guarantee you’ll receive the same treatment, but the owner, Ron, kindly agreed to take in a supply box for me, and generally went out of his way to make my stay as pleasant as possible. The actual cafe serves teas, coffees, cakes and sandwiches, and you may be able to stock up on snacks for eating during the day (but it certainly isn’t sufficient for a full resupply). Unless you plan to carry food for the entire trip from Fort William, I recommend contacting the Dalwhinnie Bunkhouse to ask about the possibility of sending a supply box in advance. Dalwhinnie also offers bus and train connections, should you be forced to abandon the trail. 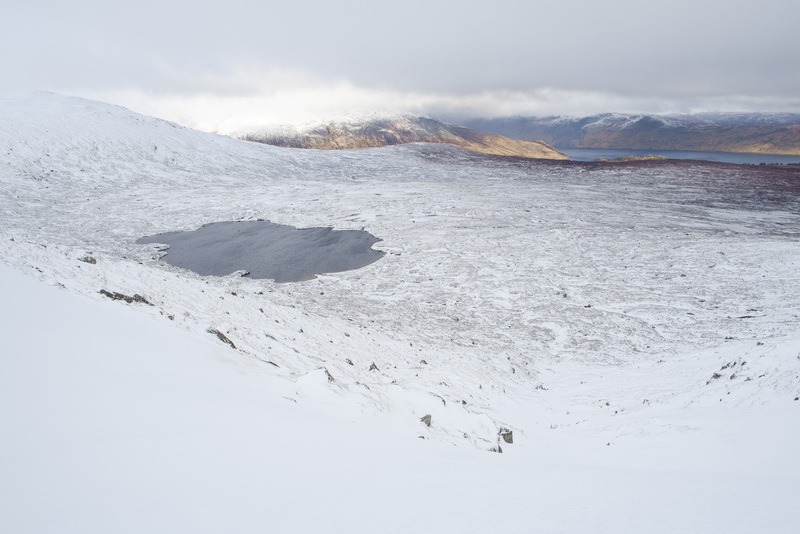 As described, the route only has one foul-weather alternative, bypassing Ben Alder itself. This is quite deliberate. For much of the route, although it would be possible to detour at low level in the event of bad weather, this would usually defeat the purpose of the trail. Also, if you’re experienced enough to hike it, you’re experienced enough to devise your own foul-weather alternatives! This guide is best used in conjunction with your maps as you plan. The first day on the trail is fairly easy, without any major ascents or significant obstacles. It follows Glen Nevis from its mouth at Fort William to its watershed beneath Coire Rath, and down the lesser glen of the Abhainn Rath to Stoaineag bothy. The first few miles follow the road out of Fort William and into Glen Nevis. Walkers may prefer to drive or hitch-hike down to the car park at the road’s end near Steall Falls; this cuts 7 miles / 11km from the start of the route. However, even though it’s on tarmac, this first part of the walk is quite scenic and well worth doing if you have the time. From Steall, the path becomes far rougher. The popular walk from the car park to Steall Falls is likely to be very busy. After enjoying the view from Steall meadows, continue along the obvious path heading east along the side of the river. After just over a kilometre the path splits in two and becomes far less distinct. The better route tends to stay lower, closer to the river, but you’ll come across a more distinct trail at about NN 168 691. Keep heading east. The glen continues, narrowing and climbing somewhat to the flat and boggy area surrounding Tom an Eite. Here there is an unavoidable river crossing, usually easy but may be more challenging in spate. Continue east along the north bank of the river. You’ll come to Meanach bothy first. If the rivers are high, you may wish to stop at this bothy, as you’ll need to cross the Abhainn Rath to get to Staoineag. However, Staoineag is a much nicer bothy, and it can be reached on the other side of some stepping stones a couple of kilometres after Meanach. There are many wild camping opportunities in this part of the glen. Although the first part of this walk is straightforward, and in good conditions the ascent of Carn Dearg and Sgor Gaibhre will present no problems for most walkers, this is undeniably a more serious day than the first. Follow the path from Staoineag along the southern bank of the river before emerging at the bridge at the southern end of Loch Trieg. Keep heading east along an obvious track, through an arch under the railway and uphill slightly to the Ossian Hostel (excellent accommodation here in a beautiful setting). Continue east, striking uphill towards Peter’s Rock marked on OS maps. At this point, where the track from the Ossian Hostel meets a north/south track, head due east up rough hillsides to meet the crest of Carn Dearg’s NW Ridge. Follow this ridge to the summit of Carn Dearg at 941m. In good visibility the ridge to Sgor Gaibhre is obvious, but if the clag is down then you will need to take a bearing here – beware of steep ground! Head NE, mostly descending but with a couple of minor rises in the broad ridge until you descend to the Mam Ban. From this bealach a gentle shoulder rises through heather to the summit of Sgor Gaibhre at 955m. The descent from Sgor Gaibhre is the technical crux of today’s route. Descend steep slopes NNW to the Bealach nan Sgor. Here you need to descend a steep gully due east. I have never been here in summer conditions, so I don’t know the condition of the gully in the warmer months, but I suspect it’s loose. Take great care! 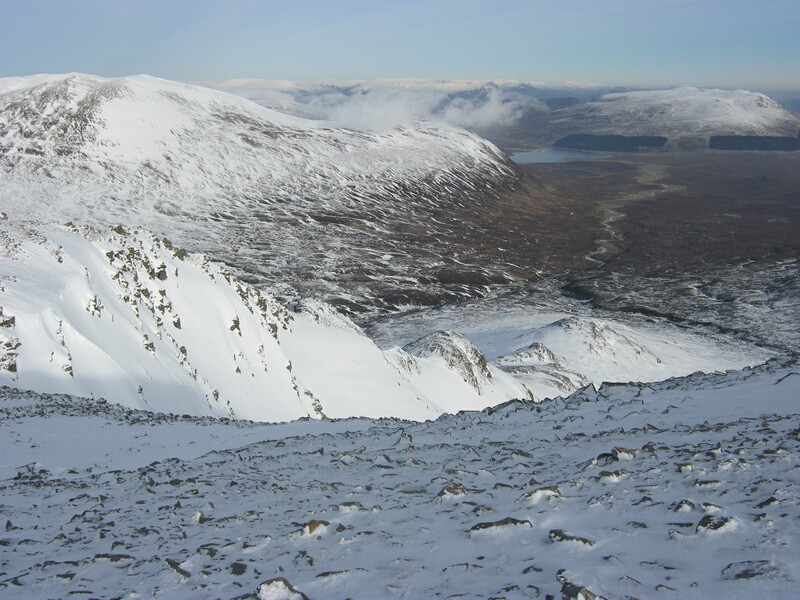 In winter conditions, a considerable buildup of steep snow is likely, and the top few metres of the gully qualify as Grade I winter climbing terrain. There may be a cornice here, so watch out! I strongly recommend an ice axe and crampons for this descent. Fortunately the difficulties are short lived, and soon the descent eases to the boggy ground surrounding Lochan a’Bhealaich. Head slightly north of east, crossing one larger watercourse as near to the lochan as possible and several smaller burns. The ground is very rough and boggy here, and you will need to plot the best course you can through the peat hags. Aim for the south bank of the Allt Tom a’Chogaidh here, which you should follow almost down to the shores of Loch Ericht. The descent is rough and tiresome and you’ll definitely get your feet wet! When the terrain flattens off, at about NN 491 676, avoid a large boggy area to the south before joining a path heading north through the woods of An Grianan. This path, boggy in places, leads to a footbridge over the Alder Burn. The Alder Cottage, a superb bothy, lies on the other side. This is the most difficult day on the trail, and the route’s high point in every sense of the word. Ben Alder is a magnificent Munro surrounded by beautiful wild country. To climb it from Ben Alder Cottage, ascend the steep path past Prince Charlie’s Cave towards the Bealach Breabag. Before reaching the bealach, turn left and leave the path, climbing on the left-hand side of a vague spur of rocky ground. Your goal is the 1,104m top of Sron Bealach Beithe; in winter conditions beware avalanche risk on these convex slopes. From Sron Bealach Beithe, follow the rim of Garbh Choire to the 1,148m summit of Ben Alder. Descend west, at first across a gentle plateau and then down a steepening stony shoulder to the path coming from Bealach Cumhann. Follow this path NE to a bealach, then down a deep valley past the now-defunct bothy of Culra. The path continues to Ben Alder Lodge where it becomes a good track beside Loch Ericht. Follow this track to Dalwhinnie. If conditions on Ben Alder are too severe, there’s an easy foul-weather alternative all the way from Ben Alder Cottage to Dalwhinnie. An obvious path follows the shore of the loch east directly from the bothy. When you round the headland the path is initially vague, with some steep, loose ground above the water, but it soon becomes a good track. Follow it for several miles until, almost at Ben Alder Lodge, it diverts steeply left through woodland. Re-join the track and follow it to Dalwhinnie. Another high-level route, this time climbing to the summit of the Munro Carn na Caim. Walk south along the road from Dalwhinnie, and cross the A9 just south of the Wade Bridge. There’s an obvious land rover track climbing easily through moorland to a 902m spot height. From here, navigate north to the summit of Carn na Caim – easy in good visibility. From Carn na Caim, the objective is to reach the descent to Glen Tromie at Bruthach na Craoibhe. My route consisted of nine different legs across the open plateau, skirting the rim of Coire Chais to the north before bearing east. Take particular care with your navigation in poor visibility or snow, because it’s very easy to get lost if you aren’t on the ball, and there are no paths. You may find a GPS useful in addition to your map and compass here. The steep descent down the nose at Bruthach na Craoibhe follows an obvious zigzag path. Once in the glen bottom, cross the Allt Loch an Duin (straightforward in most conditions) and follow the land rover track north through the glen. There is another ford in a couple of miles, across the Allt Gharbh Ghaig. Camping possibilities abound in this area, but be sensitive to the fact that this is a working glen; don’t camp too close to Gaick Lodge. There are some good spots around the edge of Loch an t-Seilich. This is perhaps the least interesting day on the Alder Trail. Its sole purpose is to get to Glen Feshie, and it passes through some fairly uninspiring grouse moorland, but a few navigational intricacies help to spice things up. There’s plenty of heather-bashing and bog-hopping on this leg of the journey! Continue north on the track through Glen Tromie until you reach the bridge over the Allt Bran, then turn immediately right. A path is marked on the map, but this is invisible on the ground; just continue along the north bank of the river as best you can, passing a weir until it’s possible to pick up the course of a vague, sporadic track. Aim for a stand of woodland on the eastern side of a spur coming down from Carn Dearg. Leave the vague path and follow the left edge of this plantation, crossing some hideous bogs, then pick up a better track along the north edge of the plantation. The map shows a path cutting through the plantation towards another one, but in 2015 so many fallen trees blocked the path I found it easier just to keep following the land rover track as far as Lochan an t-Sluic. From this point an obvious and easy path descends to the meadows of Glen Feshie. 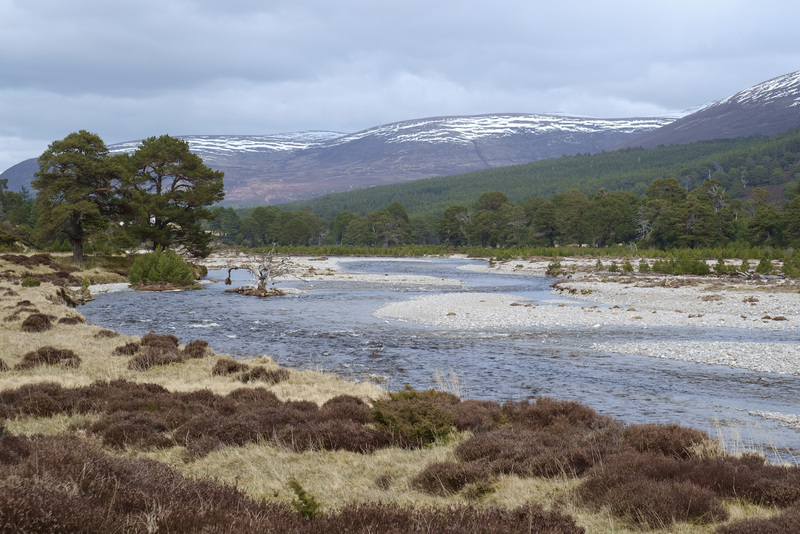 Unless water levels are very low, don’t attempt to ford the Feshie, which is a serious watercourse. Instead, walk north on good tracks until you reach the bridge over the Feshie just south of Achleum. 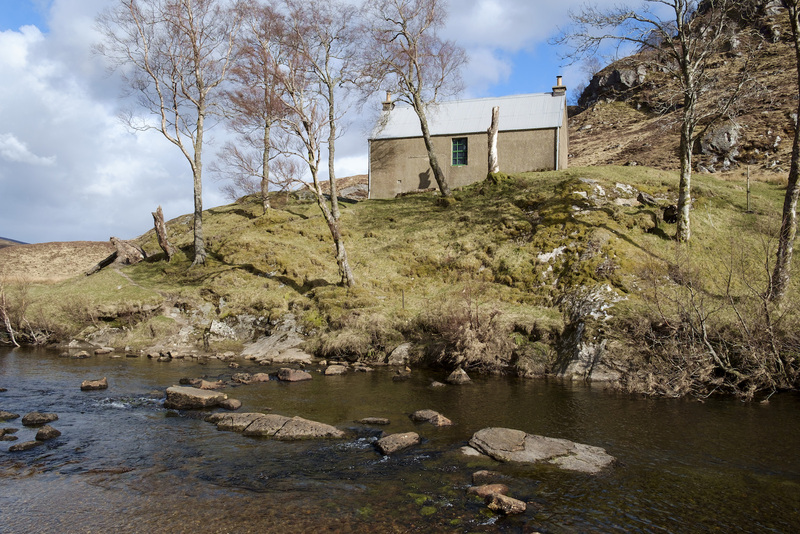 Wild camping possibilities abound on the east bank of the river, and there is a bothy a couple of miles to the south (Ruigh Aiteachain, although at the time of writing in November 2016 it is closed for renovation). On this day the trail crosses one of the most special places in Scotland: the Moine Mhor or ‘Great Moss’, an elevated plateau deep in the heart of the Cairngorms. The terrain is relatively serious here. 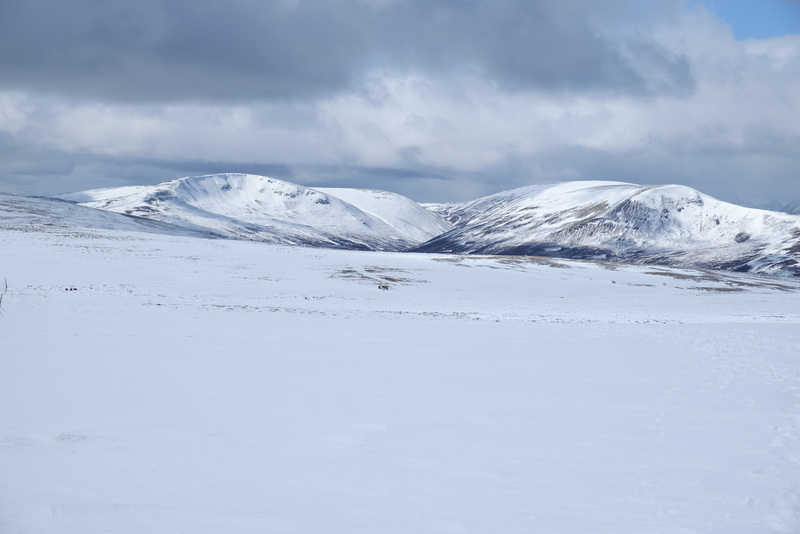 Although slopes are often gentle and only on the descent to Glen Geusachan is steep ground encountered, this plateau holds snow for much of the year and navigation can be very challenging. Think twice before attempting this leg of the Alder Trail in bad weather. 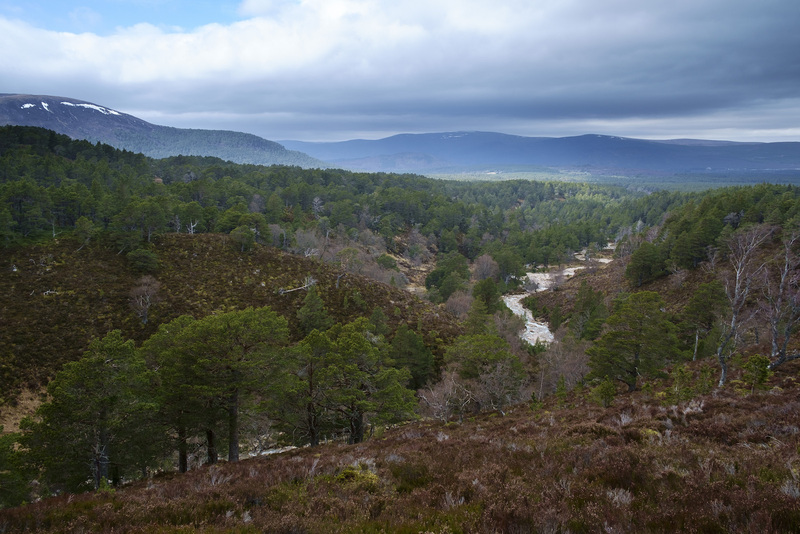 From the bridge over the Feshie, climb through the woodland at the base of the Allt Fhearnagan. These paths are often vague and seem to peter out, but stay close to the watercourse and you won’t go far wrong. Once out of the woods, climb on the obvious path into Coire Fhearnagan until you reach the shoulder just beneath the summit of Carn Ban Mor. There may be steep snow at the headwall of Coire Fhearnagan. Navigate to Loch nan Stuirteag, a lochan between Monadh Mor and Sgor an Lochan Uaine. Start by following a footpath SE, which passes to the north of a 957m spot height before veering east towards a burn. Cross this burn, then head due east to bealach 876m. Contour around the northern side of Tom Dubh (918m) and follow the north bank of the Allt Luineag. 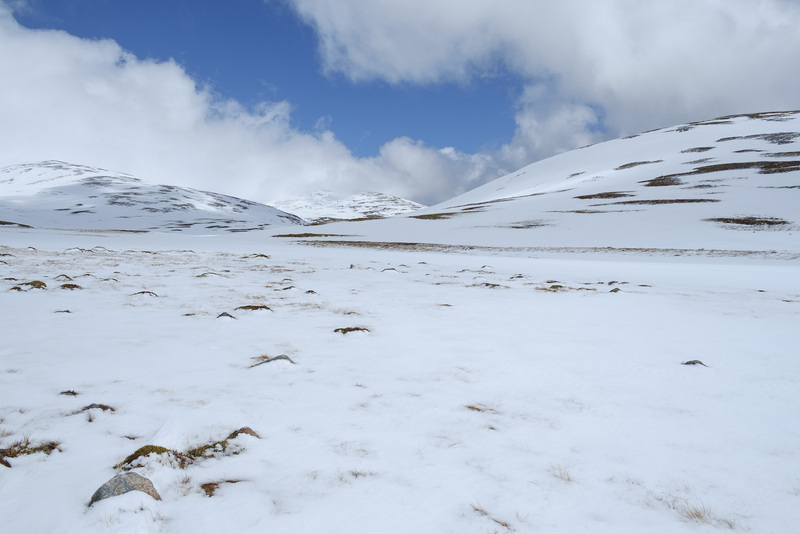 In winter and spring, beware of lochans and watercourses concealed beneath deep snow pack. From Loch nan Stuirteag the views east down Glen Geusachan are dramatic. This is one of the finest situations on the Alder Trail and would make a grand location for a wild camp. If pressing on to Corrour, skirt the north shore of the loch and descend steep ground carefully, looking for the best place to cross the Geusachan Burn. It falls in steep cataracts initially but there are several places where it should be possible to cross with care. You want to be on the north bank of the river by the time the glen flattens out, as the river quickly becomes a lot more difficult to cross further down. Follow the north bank of the Geusachan Burn and contour around the lower slopes of the Devil’s Point when the river veers south to join the River Dee. Walk north along the west bank of the Dee until you reach Corrour. Corrour is an excellent but small bothy, and is often extremely busy. You may have to camp if it’s full. If you have extra time on your hands and the weather is nice, you may feel like staying here an extra day and climbing some of the nearby Munros. 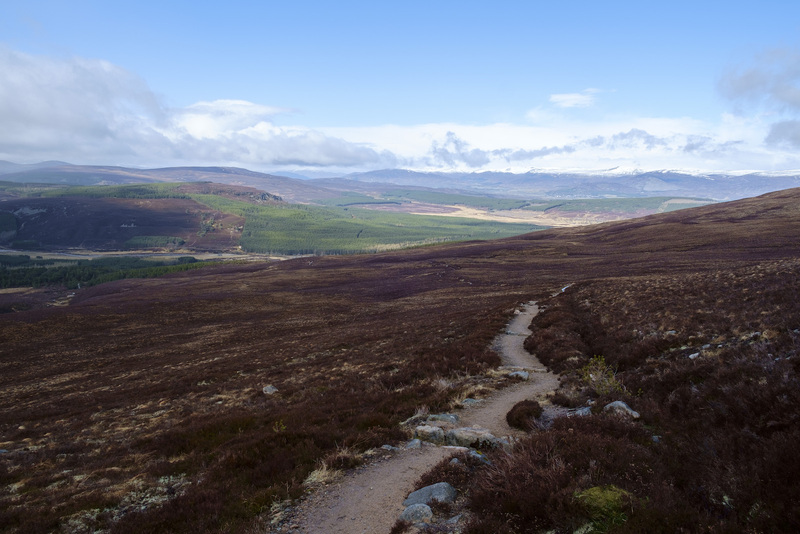 The Alder Trail’s finale is a classic route: the Lairig Ghru to Aviemore, passing through fantastic Cairngorms scenery. Although there’s a good path the whole way, snow may obscure parts of the trail for much of the year, even well into May. I have seen icebergs floating in the Pools of Dee at the top of the pass in early June before. Otherwise there are few objective hazards on this leg of the journey. Cross the bridge over the Dee and head north. After a couple of miles, views open up west into Garbh Choire, the place where snow lasts longer than anywhere else in the Scottish mountains. If visibility is good you’ll almost certainly see snow patches or snow fields on the upper cliffs of Braeriach. The path steepens a little as it climbs towards the Pools of Dee, staying close to the Allt na Lairig Ghru. Skirt the Pools of Dee to the left (the path is often obscured beneath snow pack here) and then drop gently down on the other side of the pass, mostly staying to the left of the watercourse. The cliffs of Lurcher’s Crag soon rear up on your right. In winter or early spring you may see cascades of ice dribbling down these cliffs. The path crosses a boggy area and enters the forest of Rothiemurchus. The route remains obvious and soon you will begin to see signposts pointing towards Aviemore. After the Cairngorm Club Footbridge, easy tracks on flat terrain lead to Coylumbridge, and from there you can follow the road the last couple of miles to Aviemore and a well-earned pint at the Old Bridge Inn! There are numerous accommodation options in Aviemore, including the Aviemore Bunkhouse next to the Old Bridge Inn, the SYHA hostel, a campsite, and several hotels. There are rail and bus links to Inverness, and southbound trains for Perth and Edinburgh. To return to Fort William, the best route by public transport is to get a bus to Inverness, then take the number 19 bus to Fort William. More information at Citylink. All rights reserved. No part of this publication may be reproduced, stored in a retrieval system, or transmitted, in any form or by any means without the prior written permission of the publisher, nor may be otherwise circulated in any form of binding or cover other than that in which it is published and without a similar condition being imposed on the subsequent purchaser. As usual an inspirational and educational piece Alex. Thanks! Glad you found it useful and interesting.